You know you’ve done it before. Came across someone or something and immediately based your opinion on them simply because of their looks. Heck, I’m sure I have probably even done it. Unfortunately for me, this is an issue I am faced with almost on a daily basis. People and other dogs will immediately think that just because I am small and petite, I am also weak and delicate and need to be held at all times. While picking me up and carrying me isn’t always bothersome (especially on hot days when we go on long walks), the assumption that I am weak definitely does. I mean come on–I can do 10 consecutive push-ups with a Cocker Spaniel sitting on my back. 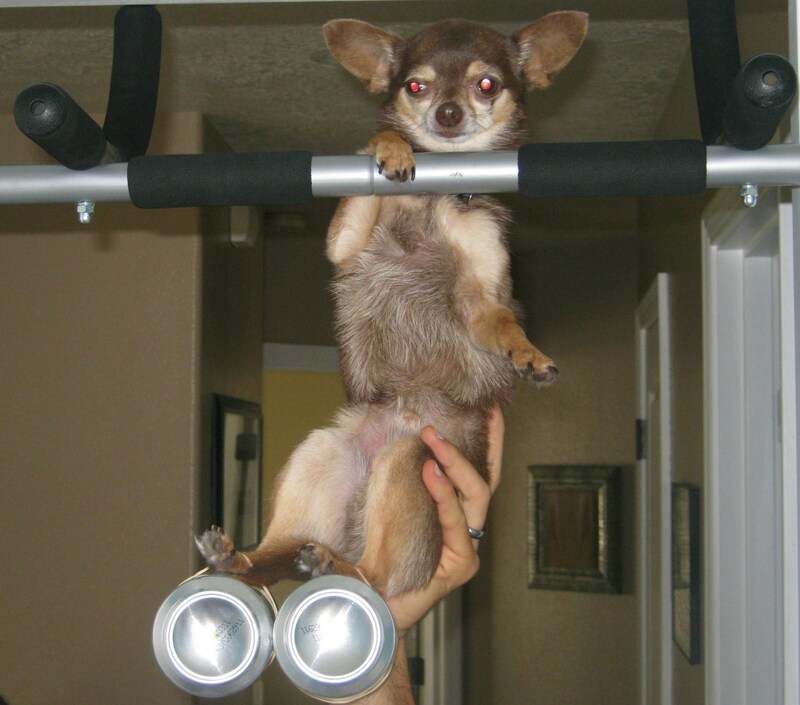 I can dominate 15 pull-ups with two cans of diet soda tied to my hind legs. I can leap tall buildings in a single bound (well that one may be somewhat of a stretch… but I can leap onto the couch without any help). Weak, I am not. Basically the point I’m trying to convey with you is, one should really never judge someone or something based on their outward appearance. By doing so, you could end up missing out on something awesome. Now with that being said, I present to you my latest chicken creation which I cooked up for mi papa last night for dinner. I’m not going to lie. It doesn’t look pretty. But try to follow my words of wisdom when you see the end result because it smells and tastes absolutely delicioso. 1) Season chicken breasts with salt and pepper. Heat 1/2 tbsp oil in a large skillet or shallow Dutch oven over medium-high. Add chicken and cook until browned and cooked through, about 7 minutes. Transfer to plate and keep warm. 2) Add onion and remaining oil to skillet and cook over medium heat until softened, about 5 minutes. 3) Add jalapeno, garlic, ginger, and spices and cook until fragrant, about 1 minute. 4) Add potatoes, water and coconut milk to skillet and bring to a boil. Reduce heat to medium-low and simmer, covered, until potatoes are nearly tender, about 15 minutes. 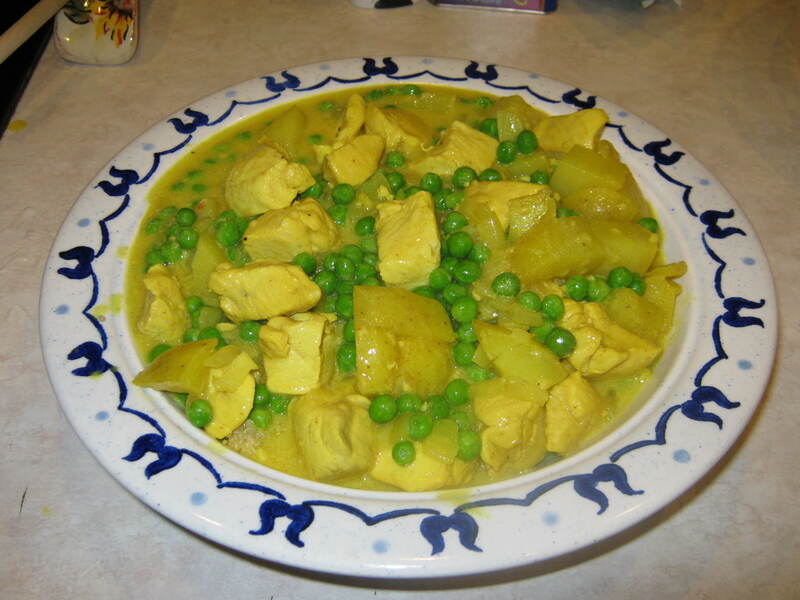 5) Remove lid, add peas and cook until liquid is slightly thickened and potatoes are totally tender, about 5 minutes. 6) Add chicken and cook until heated through, about 2 minutes. Turn off heat, stir in yogurt and season with salt and pepper to taste. 7) Serve on top of a bed of rice, quinoa, millet or couscous. And there you have it. A wonderfully tasty, albeit slightly unattractive chicken curry. Now if you’ll excuse me, mi papa is ready to spot me while I do my daily pull-ups. I’m shooting for 16 today.